The most crucial game of the last round was a loss of top-ranked Halcones (8-3) in Panama City on Wednesday night. Hosts were defeated by third ranked Caballos (6-5) 95-77. It ended at the same time the six-game winning streak of Halcones. Caballos looked well-organized offensively handing out 27 assists. It was a great evening for Puerto Rican point guard Alvin Cruz (186-82, college: Niagara) who led his team to a victory with a double-double by scoring 25 points and 10 assists. American-Puerto Rican forward Angel Matias (193-92, college: Georgia South) helped adding 19 points and 12 rebounds. American center Christophe Massie (206-77, college: Memphis) responded with a double-double by scoring 10 points and 12 rebounds. Both coaches used bench players which allowed the starters a little rest for the next games. Caballos have a solid series of four victories in a row. They maintain third place with 6-5 record having just two points less than leader Universitarios. Halcones at the other side still keep top position with three games lost. They share it with Correcaminos. Caballos are looking forward to face league's second-placed Correcaminos in Colon in the next round and it will be for sure the game of the week. Halcones' supporters also look forward to an exciting derby game next round, where their team will face at home their local rival from Panama City Aguilas. Another exciting game was a derby match between two teams from Panama City: Aguilas (#5) and Panteras (#4). Panteras were defeated at home 81-86 and even the advantage of their own court did not help. It was an exceptional evening for American swingman Lovell Cook (201-90, college: New Orleans) who led the winners and scored 25 points and 6 rebounds. Daniel King accounted for 8 points, 14 rebounds and 7 assists. Dominican power forward Brayan Martinez (203-91) came up with a double-double by scoring 18 points, 14 rebounds and 5 blocks for Panteras in the defeat. Both coaches tested many bench players in such tough game. Aguilas (5-6) moved-up to fourth place, which they share with defeated Panteras. Panteras lost third consecutive game. Aguilas' supporters look forward to another derby game next round, where their team will travel locally in Panama City to the arena Halcones. In the last game of round 11 bottom-ranked Toros lost to Correcaminos on the opponent's court 56-66. Very expected game in Colon where 6th ranked Toros (1-10) were defeated by second ranked Correcaminos (8-3) 66-56. It was an exceptional evening for American forward Terrence Shannon (203-79, college: Elgin CC) who led the winners with a double-double by scoring 21 points and 10 rebounds. 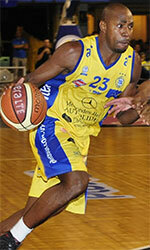 Dominican Ramon Ruiz (188-83) accounted for 21 points for the winning side. Gil Atencio (202-96, college: St.Clair) came up with 6 points and 15 rebounds and American center Wilbur O'Neal (201-88, college: Indianapolis) added 6 points and 12 rebounds respectively for Toros in the defeat. Toros' coach Humberto Rapon rotated ten players in this game, but that didn't help. Defending champion used an opportunity after Universitarios lost their game and moved up joining them at the top position. Toros at the other side stay at the bottom place with ten games lost. Correcaminos will play against Caballos (#3) in Aguadulce in the next round, which may be the game of the day. Toros will play on the road against Panteras in Panama City and it may be a tough game between close rivals. Another exciting game was a derby match between two teams from Panama City: Aguilas (#5) and Panteras (#4). Panteras were defeated at home 81-86 and even the advantage of their own court did not help. Aguilas made 19-of-25 charity shots (76.0 percent) during the game. They also forced 20 Panteras turnovers. It was an exceptional evening for American swingman Lovell Cook (201-90, college: New Orleans) who led the winners and scored 25 points and 6 rebounds. Daniel King (203-87, college: Texas Southern) accounted for 8 points, 14 rebounds and 7 assists for the winning side. Four Aguilas players scored in double figures. Dominican power forward Brayan Martinez (203-91) came up with a double-double by scoring 18 points, 14 rebounds and 5 blocks and Puerto Rican guard Jorge Matos (185-92) added 19 points, 5 rebounds and 8 assists respectively for Panteras in the defeat. Both coaches tested many bench players in such tough game. Aguilas (5-6) moved-up to fourth place, which they share with defeated Panteras. Panteras lost third consecutive game. Aguilas' supporters look forward to another derby game next round, where their team will travel locally in Panama City to the arena Halcones. 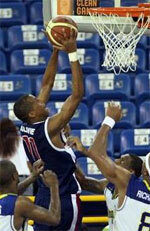 The most crucial game of the last round was a loss of top-ranked Halcones (8-3) in Panama City on Wednesday night. Hosts were defeated by third ranked Caballos (6-5) 95-77. It ended at the same time the six-game winning streak of Halcones. Caballos looked well-organized offensively handing out 27 assists. It was a great evening for Puerto Rican point guard Alvin Cruz (186-82, college: Niagara) who led his team to a victory with a double-double by scoring 25 points and 10 assists. American-Puerto Rican forward Angel Matias (193-92, college: Georgia South) helped adding 19 points and 12 rebounds. American center Christophe Massie (206-77, college: Memphis) responded with a double-double by scoring 10 points and 12 rebounds and the former international Gary Forbes (201-85, college: Virginia) scored 17 points. Four Halcones players scored in double figures. Both coaches used bench players which allowed the starters a little rest for the next games. Caballos have a solid series of four victories in a row. They maintain third place with 6-5 record having just two points less than leader Universitarios. Halcones at the other side still keep top position with three games lost. They share it with Correcaminos. Caballos are looking forward to face league's second-placed Correcaminos in Colon in the next round and it will be for sure the game of the week. Halcones' supporters also look forward to an exciting derby game next round, where their team will face at home their local rival from Panama City Aguilas.